Orange, Organic, 5X essential oil is a sweet, concentrated essential oil cold pressed from the peel of Citrus sinensis var. Dulcis and then vacuum distilled to concentrate the aromatic compounds. The difference in fragrance, from the standard oil, is significant. Orange Sweet 5X Essential Oil is much sweeter than the traditional pressed orange essential oil which is sweet and sightly tart. This 5X essential oil is, essentially, five times stronger in the Orange fragrance so a little goes a long way. Warm, fresh citrus scent, radiant, fruity and tangy, orange essential oil smells just like fresh orange peel, with a much stronger aroma. This oil provides fresh energy, supporting a clear and inspiring mind. Orange essential oil is popular in household cleaning products as it aids in cleaning and smells very clean. Always be careful on plastic and synthetic surfaces as it may affect them negatively. Orange essential oil can be added to dish washing liquids. As with other citrus essential oils just a few drops in water when washing dishes or other household cleaning will really brighten your work. Orange essential oil has a fresh orange peel scent that is calming and relaxing to the body. It can be an effective anti-aging skin care ingredient when used in moderation, always avoid heavy concentration. Using 9 drops or less to an unscented body care product per 1 oz will enhance your experience. Orange essential oil offers the exhilarating freshness of orange with its therapeutic properties in order to give users the perfect blend. With a fresh orange peel scent, this essential oil is great at providing energy and freeing of the mind. Orange adds play, generosity, creativity and abundance into life. Helps those who are stuck in scarcity thinking, rigid, workaholics, hoarding or envious. If using Orange for emotional wellness, try using it with our free EFT Tapping scripts for Stress Relief, Money Magnet, and Purification which help release these emotional issues. Oranges have been linked to aiding issues of depression, anxiety, constipation, nervous conditions, and muscular spasms. * This oil is known to be a tonic, sedative, and antiseptic as well. 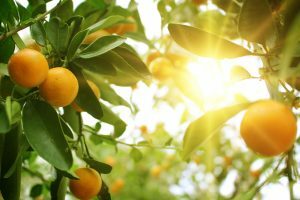 Orange oil can be used as a skin moisturizer. Simply mix a few drops of essential oil with your favorite moisturizer or coconut oil and evenly rub on the body. It can also be used to reinvigorate the skin and reduces tension and anxiety. Simply apply three-4 drops inside a warm bubble bath and soak for 30 minutes. Orange essential oil should be diluted with a carrier oil for contact with the human skin.